A pressure sensor can be created using the motion of a high permeability core in a magnetic field created by the coils of a transformer. This principle is what is used in a Linear variable differential transformer. The movement of the core is transferred from the process medium to the core by the use of a diaphragm, bellows or bourdon tube. The LVDT operates on the inductance ratio between the transformer coils. Three coils are wound onto the same insulating tube containing the high permeability iron core. The primary coil is located between the two secondary coils(S1,S2 in the diagram below) and is energised with an alternating current. Equal voltages are induced in the secondary coils (S1,S2) if the core is in the centre. The voltages are induced by the magnetic flux. When the core is moved from the centre position, the result of the voltages in the secondary windings will be different. The secondary coils are usually wired in series. LVDTs are sensitive to vibration and are subject to mechanical wear. 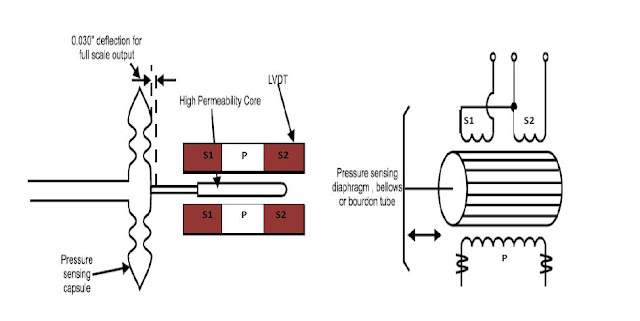 LVDT sensors can also be used as a position sensor. They can measure movements as small as 0.01 microns (0.4 micro-inch), up to several millimeters, but are also capable of measuring positions up to 200 mm (±4 inch). 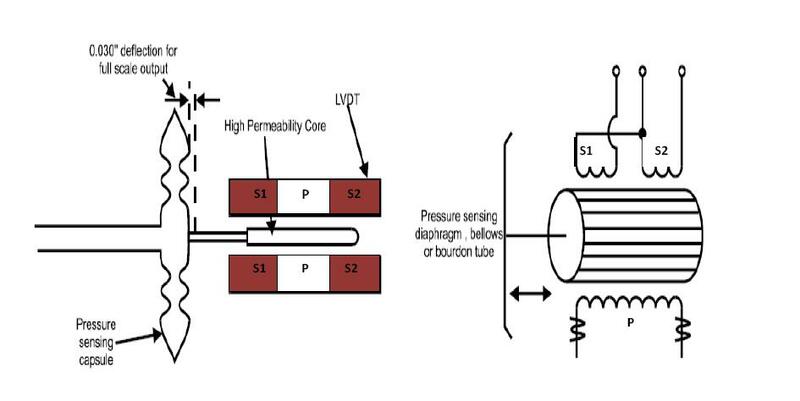 The diagram below shows a basic arrangement for an LVDT sensor for pressure measurement. The RDP Group: They are the manufacturers of various instrumentation transducers.